As a proud Murrumburr woman and the daughter of Aboriginal artist Sheril Cahill – Kylie-Lee Bradford is passionate about using art and design to celebrate her culture. And as a mother of three – with another on the way – she is also passionate about children’s comfort and wellbeing. 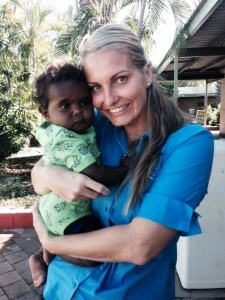 Kylie-Lee Bradford, owner of Kakadu Tiny Tots. Through her business, Kakadu Tiny Tots, Kylie has blended those passions, creating 100 per cent organic babies’ and children’s clothing and accessories that feature artwork by her mother and other Aboriginal artists from the Northern Territory. Kylie’s 2015 appearance on the television series ‘Shark Tank’ (a business/investment reality show) gave Kakadu Tiny Tots a head-spinning publicity boost. But Kylie already knew that long-term success is more of a “slow burn” and had approached IBA for assistance to strengthen her administrative and financial reporting skills. Through its Business Development and Assistance Program, IBA also provided Kylie with support to redevelop her website and online shop. This has assisted her to manage and maximise a recent influx of new customers and contacts. Here Kylie discusses the opportunities and challenges of building both an online business presence and loyal community of customers in a crowded online marketplace. Kylie-Lee applies Aboriginal designs to her children and babies clothing. As a proud Murrumburr woman and the daughter of Aboriginal artist Sheril Cahill – Kylie-Lee Bradford is passionate about using art and design to celebrate her culture.Being a mum I have my own instincts about what I want my babies to wear: beautiful, organic cotton clothing that keeps them warm and comfortable. Through my business I can do that as well as fill a gap in the market for quality babies’ and children’s clothing that acknowledges and represents the Aboriginal people of Australia. My mother is Sheril Cahill, a Traditional Owner of the Kakadu National Park and my company’s head designer. For 35 years she has designed jewellery, clothing and accessories for our community and for clients worldwide. Many of the Kakadu Tiny Tots designs – such as the Kakadu freshwater turtle (Almunngie) – are inspired by her childhood experience of growing up in Kakadu. Tags attached to each piece of clothing give people an opportunity to learn more about Kakadu, so wherever they are in the world, they have an opportunity to engage with my culture. And that’s the result of building my brand and making sure I am telling our unique story: I have this beautiful product, with a beautiful Aboriginal story, made from beautiful organic fabric. And I find mums in particular appreciate that story and the fact they can trace where and how it’s been made, what it’s made from. I grew up in Patonga, which is an Aboriginal community in the Kakadu National Park. My ties to home and community are incredibly strong, and every time I go back home people say, “Girl, you’re doing such a great job”. They are so proud of me, and that’s a priceless emotion. The young girls say, “We want to be like you”, and they ask “How did you do that? How did you get started? In setting up Kakadu Tiny Tots I wanted to show my daughters and other young Aboriginal girls that you can achieve your goals – it takes a lot of hard work, but you can do anything you want. A lot of the local kids leave school early; it happens, but it doesn’t need to be the end of your dreams… So through my business I try to be a role model … to say “I did this. You can do this””. Because the learning never stops: ‘I learned I needed to reconcile the time I spent on the financial and administrative side of the business with the more fun, creative side’. 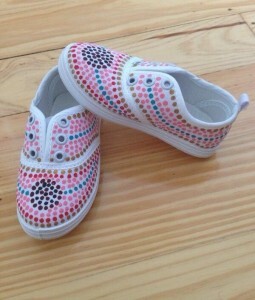 A pair of baby shoes designed by Kylie-Lee Bradford for Kakadu Tiny Tots. I approached IBA when I got my first full range of clothing in stock, about seven months into starting the business. That’s when I became aware of how important it was to keep my accounts in order, and to get a proper marketing plan and business plan together. I learned I needed to reconcile the time I spent on the financial and administrative side of the business with the more fun, creative side. I used to think, ”I don’t want to do the books, it’s boring”. But I learned very, very quickly that if I don’t get my books right the whole business goes pear-shaped. Independently I have also spent a lot of time researching social media and looking for courses to increase my skills. And I can’t recommend that enough. People think “I know how to do Facebook” – but your personal Facebook and business Facebook are much different. Many people don’t know the half of what these social media platforms and websites can do for their business. …and you need to do your homework: ‘I’ve experimented with posting at different times of the day but haven’t gotten the same level of feedback or engagement’. I’m learning about website analytics – all the information about our visitors, what content is most popular – and also Facebook adwords, and all the reporting information behind the platform. There’s so much information available to help you position your business online. And I use those analytics to help with my marketing. So on Facebook I’ve found the best time to post is in the morning around 7am when our followers are scrolling on their phones, having their coffee, getting their breakfast maybe. During the day mums are busy so the rest of the day is a bit of a write-off. I’ve experimented with posting at different times of the day but haven’t gotten the same level of feedback or engagement. Customer service and communication are really important, and anything you’d normally do in a retail shop, you have to do plus-tenfold online. For instance if I don’t respond to an online enquiry for a day or so, I’ll lose that sale. And when I do respond I point out the free shipping on the website or invite the customer to phone me direct. It’s about keeping those conversations going. Getting followers to jump over to the website from Facebook can be difficult. You have to get them interested in the product first, rather than posting about your prices all the time. I’m getting better at converting Facebook followers into buyers. But it’s equally important not to be bombarding people with information. I believe that doing fewer, more meaningful posts is more respectful to my audience, many of whom are mums like me, and are often time poor. And that’s why I only do one post a day – it’s unique, it’s a bit special, and it’s easy for them to revisit later in the day. My Facebook “likes” are still up, so I can only think it’s working. Our first online shop didn’t have our competitors’ boutique look or usability. With support from IBA I’ve done a revamp of the website and it looks beautiful and professional. There’s a lot of noise to compete with online, and I think you have to try to capture and maximise your publicity and marketing moments quickly. After my mother and I appeared on the television show ‘Shark Tank’ sales and enquiries took off and it’s been pretty frantic since. But I have to work with that and not waste the opportunity. Currently I’m going back and touching base with sales made after that show, asking customers how they liked the products, and building those relationships. Because you need to mother yourself, too: ‘Everybody needs something, whether it’s yoga, pilates, the gym… something that will clear your mind, and that’s healthy for mind and body. I set this business up to be able to achieve more balance between my work and family life. Yet in the first year, my littlest one would come and close my laptop while I was working on it. She was letting me know “You’re not spending enough time with me…” It’s so easy to get consumed with the business and suddenly it’s “Shush, mummy’s working”. So time management is absolutely crucial, and it means more than what I can get done in a working day; it’s about looking after my health and wellbeing as well. That’s where it’s important to have a clear ‘knock off time’ at night. I allow myself to say, “Ok it’s 9 o’clock, I will shut down now, go to bed, and add that job to my list for tomorrow”. Business ownership isn’t easy, and there are days when I think it would be easier to have a 9-5 job in a café down the road… …. But other days I think “This is my creation. This is what I have developed, and this is what I achieved today”. And that keeps me going. Find out more about Kakadu Tiny Tots and IBA’s Business Development and Assistance Program.